Quantity Per Pack Based on customer requirement. 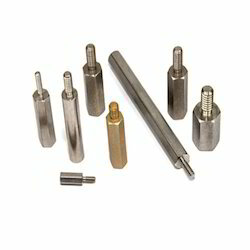 We offer a wide assortment of Standoffs and Adapters in different dimensions. These spare parts are made using supreme quality stainless steel and cast iron procured from established vendors. These vendors have been associated with us since a long duration. These products are widely appreciated for their durability, compact design and resistance properties. We offer them at industry leading prices. Looking for Standoffs and Adapters ?